Organic dog shampoo can help to prevent dryness and skin irritation in your dog. If you are concerned about the ingredients in commercial dog shampoos, or if you have a dog with sensitive skin, you might consider making your own organic dog shampoo. Organic dog shampoos can be beneficial for your dog's skin -- and if you make it yourself, you can save yourself some money. The key to keeping your shampoo organic is to use organic ingredients. Beyond that, you have the freedom to choose whatever scents you like. You can even add certain ingredients to make your organic shampoo flea-repellent. Rinse out an empty squeeze bottle or purchase one from your local grocery store. Storing your shampoo in squeeze bottles will make it easier to use when bathing your dog. Pour one cup of water into the bottle and add 1 teaspoon of organic liquid dish soap. If you are worried about skin sensitivities, select an unscented dish soap -- otherwise, pick a scent you like. Pour 1 teaspoon of organic olive oil into the bottle and shake well to combine the mixture. Add 1 teaspoon of aloe vera to your organic dog shampoo if your dog has allergies or skin sensitivities. The aloe will help soothe dry, itchy skin. Make your organic shampoo flea-repellent by boiling 1 cup of distilled water with 3/4 teaspoon soapwort. Let the mixture cool, then add 2 teaspoons each of organic lemon oil and organic lavender oil. Use your homemade organic dog shampoo as you would use normal dog shampoo, applying a small amount along your dog's back after wetting down his fur, and working the soap into a lather. You may need to shake the bottle each time to combine the ingredients. 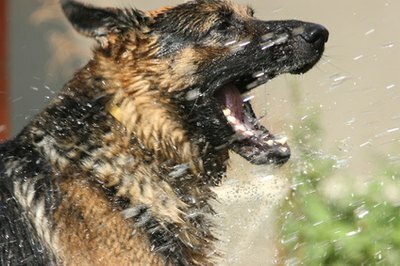 When bathing your dog, avoid getting his eyes wet or getting any of the shampoo in his eyes. To protect the dog's eyes, either wash his face with a damp cloth or apply some protective opthalmic ointment or petroleum jelly around his eyes.